I recently found another challenge to do. The six months + six dresses has been awesome - but I only have two more to go before it's complete. (Sad face). Seeing as how I'm ready for fall I've been trying to come up with another challenge to take part in. Not so ironically, I found out about it through Kyla (the creator of the six months + six dresses project). Elsie is hosting the 4 Simple Goals challenge. The idea is to create four simple, attainable goals that will make your life happier and that are not results-based. Blog about your goals as you accomplish them, give yourself rewards when each of them is completed (big or small), and have them finished by the end of the year. 1) Spend time outside every day during the fall. It's my favorite season, and my schedule is busy enough where I don't want to miss out on the day-to-day changes of it. I'm not limiting myself to saying I need to take a walk every day, but even if it's only five minutes on our back patio, I'm going to truly stop to drink it in. 2) Carve out and enjoy more time with the mister. Ben and I have gotten better at not just sitting on the couch in the evenings (this has helped), but as my baby fever grows I don't want to be wishing away time when it's still just the two of us. I am absolutely, positively, crazy about this man I married and I want to show him that more. 3) Take care of myself by writing and sleeping more. (Just not at the same time). I lumped these two together because I really need to make them both a priority. When I don't get enough sleep, everything slows down. My thinking skills, my cheerful-ness, the ability to fake caring what people are talking about...you get the point. Something else that falls by the wayside is my writing. When I was little I always wanted to be an author. In middle and high school I wrote novels. Albeit horrible badly written ones, but I wrote them. In college my senior thesis was accepted into a nationwide conference. I think I've associated writing for so long with school that I'm afraid to do it without knowing someone will be "grading" me. So I'm going to start writing for me again. (I consider this blog writing, but I'm also going to explore other types of writing as well). What do you think readers? Do you have any simple goals you're setting for yourself? Are any of you participating in this challenge as well? (Be sure to check out Elsie's goals here). I'm still focussing on the eat better/move more one.. maybe I should spice it up a bit too though! I have a hard time coming up with goals that aren't 'results' orientated... I think the whole "goals should be measurable" thing has been ingrained in me for so many years, it's tough for me to come up with goals w/out boundaries or a checklist... But that's the type A person in me, I guess! 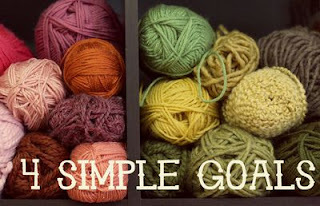 I am focusing on my 30 before 30 goals right now, but in addition to them, I want to make timem to knit each week! Great challenge - I'm all about setting goals! I'm still working on my 26 Before 26, and I think I'm pretty on track :) I think I'm going to try and enjoy as much of fall as I possibly can - because it only lasts about 3 weeks here before Eternal Winter sets in! I love all of these Becky, but I completley agree with the one about spending time outside. I love being out in the fall whether out at a bonfire with friends or just standing on the deck watching my breath hang in the air for a moment or two. I'm so with you on the sleep thing =) I am still struggling with the sleep aspect of my life (I have ever since DC) and it's affecting so many areas of my life! Making me crazy. I love these goals, Becky. Cheering you on! These are great! I love the non result-oriented goals approach. I am so freaking sick of setting goals for myself, I have to say. i like those!!!! i want to spend as much time outside as possible in the fall too! !